Last month when India was playing with Bangladesh and was on the verge on winning the test match, I was stuck up in office due to some urgent assignments. When I was done with my work, I tried to check for the scores of Indian team however could not get any clear details. Finally my colleague advised me to check the scores on UC-Cricketapp. I had never heard of anything known as UC browser and it was altogether a new thing for me. I downloaded the UC browser in my smartphone and to my utmost surprise I could see a blue colored icon marked as "UC-Cricket". This app provided me with the real time scores and the latest news regarding cricket service. And within a matter of few seconds I got all the information that I needed regarding the match. Now, I was really curious to know about this new browser and the app which actually helped me a lot to stay updated, so I began exploring this browser to understand it better and discovered certain exceptional features of the UC browser. Launched in April 2004 as a J2me-only application, UC browser was originally designed for smartphone by UCWeb, also known as UC Mobile. Currently, the browser is available on Android, iOS, Windows Phone, Symbian, Java ME and Blackberry devices. It was in 2010, when the first iOS app was introduced by UC Browser in the Apple App Store. Though initially developed for smartphone, UC browser is now available for desktop users with all its apps. Earlier this year, when the 2015 Cricket World Cup was on the verge of commencement, UCWeb introduced their new app known as UC-Cricket in the UC Browser for Android devices. I found the UC-Cricket app to be best and true to its words it provided the live updates, results, including information for upcoming matches. The app further also provides a chat option wherein cricket fans can chat with other cricket fans. The app is currently available in India, Pakistan and Bangladesh. 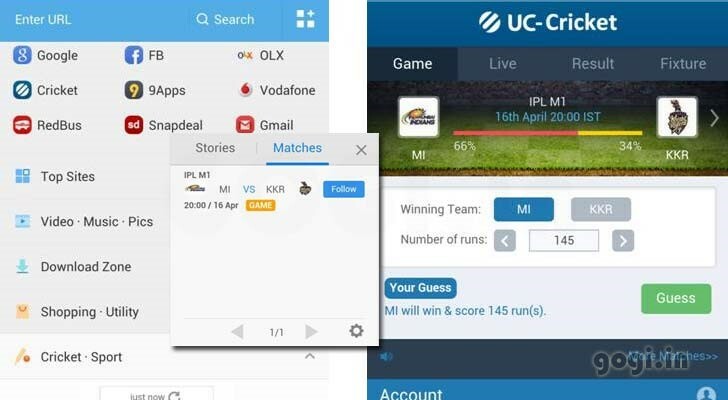 With UC-Cricket, users can get real time notification features that runs in the background and at the same time get latest scores as well. Besides, UC-Cricket app the browser also offers Hot Video app wherein users can watch and download Hot Bollywood videos and movies for free. Users can enjoy latest Bollywood trailers, music and videos all in one place. The highlight of this app is its speed and all the latest videos can be downloaded for free of cost. Another awesome feature is its UC Cloud. UC Cloud enables users to sync bookmarks, tabs and browsing data between the smartphone devices and PC across UC accounts. Users can also sync their data across multiple devices such as browsing data between Android, iPhone, iPad and all those platforms on which UC browser is compatible. UC Cloud also provides plugins for Chrome and Firefox browsers. UC browser can be used by users to share the Facebook, Twitter with the WP version which offers much more sharing options. UC browser has a friendly UI. Android has the largest user base for the browser and the Google Play store offers three versions of UC browser namely: UC Browser mini for Android, UC Browser for Android and UC Browser HD for Android. So if you are tired of using the Chrome and Firefox. Get the UC browser downloaded for your devices, be it smartphone or desktop and do enjoy the fast downloads and the awesome features offered by this browser.